Bowling Green's John Schilling (left) controls the puck against Mercyhurst's Zach Todd during Saturday's game (Photo by Todd Pavlack/BGSUHockey.com). Bowling Green snapped its three-game losing streak and its school record scoring drought Saturday night. Pierre-Luc Mercier, Mark Friedman and Tyler Spezia scored goals, and Chris Nell made 22 saves to lead the Falcons to a 3-0 victory over Mercyhurst in a nonleague game at the Slater Family Ice Arena. The Falcons played well during the final two periods after a sluggish first period, finishing with a 32-22 edge in shots on goal. Second-period goals from Mercier at 9:07 and Friedman on the power play at 16:56 gave BG a 2-0 lead. Spezia finished the scoring at 10:38 of the third period. The Falcons hadn’t scored in any of those three losses, 3-0 and 2-0 at home against Northern Michigan Feb. 3-4, and 5-0 at Ferris State Jan. 28. The Falcons are idle next weekend before finishing the regular season Feb. 24-25 at home against Alabama-Huntsville in a Western Collegiate Hockey Association series. BG is 15-17-2 overall, while Mercyhurst fell to 11-15-4. 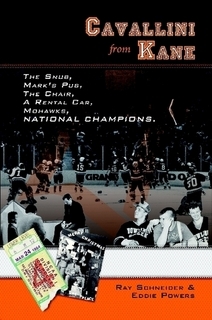 MILESTONE: The game was part of the university’s celebration of the 50th anniversary of the BGSU Ice Arena, which was renamed the SFIA in December. An announced crowd of 3,584 watched the game. Falcon alums from all decades, including players from BG’s club program that preceded the varsity program, were in town for the weekend. “It’s been great, overwhelming, humbling, exciting,” Bergeron said of the weekend. “I feel like I’m making some friendships with these alums, both more-recent kids we’ve coached and guys who were here 10, 20, 30 years ago. It takes time to develop relationships. I believe in those relationships. It’s been a fun weekend. BG finally began to feed off the lively crowd and the atmosphere in the arena during the second period. Mercier said the team enjoyed having the alums in the locker room. Among those in attendance Saturday were members of BG’s 1984 NCAA championship team and 1987 Central Collegiate Hockey Association regular-season championship team. “It’s been fun all weekend. Having them here in the crowd is an experience,” Mercier said. OFFENSE: The Falcons played a large part of the game in their offensive zone where they generated plenty of quality scoring chances. Mercyhurst freshman goalie Colin DeAugustine kept his team close with 28 saves, 15 in the second period. The Falcons scored three or more goals in a game for just the second time in their last seven contests. Mercier ended BG’s drought at 209:07, and Friedman added his goal just 7:49 later. Mercier’s goal was his fifth of the season, but the first since Nov. 18 when he scored twice at UAH. “Our last two periods were definitely strong,” Mercier said. DEFENSE: The Falcons allowed just the 22 shots and few point-blank chances, but Nell was very good the few times he needed to be. Seven of Mercyhurst’s shots came on the power play. FINALLY: Nell finally raised his save percentage over the .900 mark after stopping just 81 of 96 shots in his first four games this season The junior has a .902 save percentage in 27 games. He has a 2.35 goals-against average. The shutout was Nell’s second of the season and the school-record ninth of his career. He began the season tied with Tyler Masters and Andrew Hammond for BG’s career record with seven. 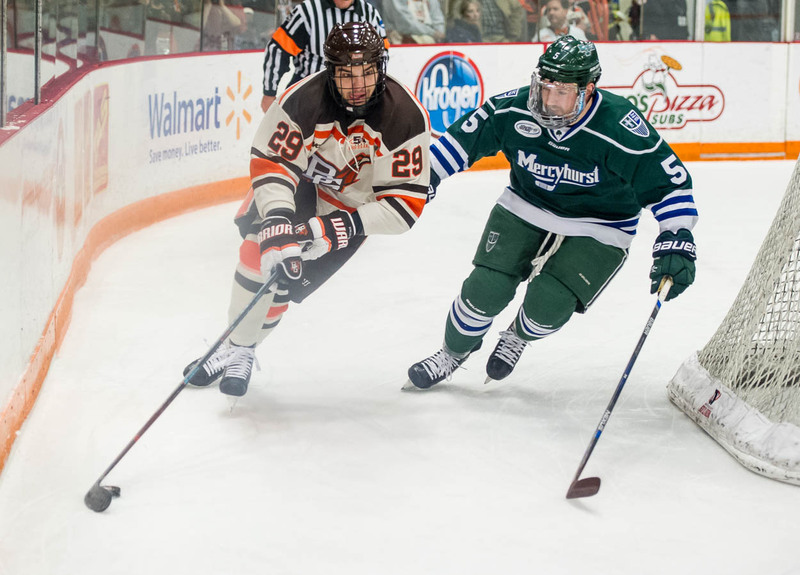 SPECIAL TEAMS: The Falcons held Mercyhurst scoreless on all four of its power-play chances. The BG power play was 1 of 8. RETURN: BG defenseman Adam Smith returned to the lineup against Mercyhurst after missing seven games with a hand injury. BAYLIS: BG forward Stephen Baylis left the game early in the third period with an upper-body injury suffered when he was hit into the boards. He didn’t return. Although the injury was still being diagnosed after the game, Bergeron didn’t think it would prevent Baylis from playing against UAH. The off weekend also gives Baylis an extra week to heal. INJURIES: BG forward Jakob Reichert missed his third straight game because of an upper-body injury, while forward Matt Meier already is out for the season with an upper-body injury. NON-LEAGUE: The win gave BG a final nonleague record this season of 3-4-1. ACADEMIC AWARD: Three Falcons — seniors Kevin Dufour and Tomas Sholl, and junior Mitch McLain — were among 145 players to receive the WCHA Scholar-Athlete Award, the league announced Thursday. To be eligible for the award, players must have completed at least one year at their present school, and have a grade-point average of at least 3.5 on a 4.0 scale for the two previous semesters or three quarters. Players also can qualify if their overall GPA is at least 3.50 for all terms at their present school.